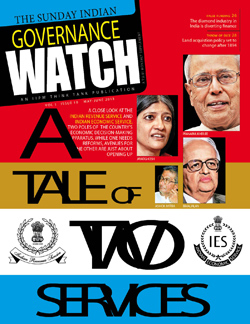 This latest edition of the Governance Watch deals with the intricate and complex issue of economic administration in India. The history of the taxation since time immemorial has been the history of the attempts of one class to make other classes pay for their expenses or, more appropriately, for the expenses of the state. The Indian Revenue Service (IRS) and the Indian Economic Service (IES) are two ends of the economic administration spectrum in the country. Last year the number of posts for economic advisers in central ministries were increased to 89 from 52. If the IAS allowed the IES officers at higher positions, how would they have a larger-than-life role in the Central government? The formation of IES was in the context of India launching herself on the path of economic development in the early 1950s. The Indian diamond industry has been in the grip of an unprecedented liquidity crisis, the likes of which not seen for the last 50 years. After weeks of hectic negotiations between various political parties, the Land Acquisition and Rehabilitation and Resettlement Bill could be introduced in the second half of the Monsoon session which reopens on April 22 after the traditional lay off. It is a peculiar case of how secrecy and protection of the right to privacy of the income tax returns of Members of Parliament (MPs) and Members of Legislative Assembly (MLAs) can override larger public interest.